With the launch of its new flagship smartphone, OnePlus 6, OnePlus takes a leap of faith, and rivals Apple iPhone X, with competitive features, right down to the “notch”, and for less than half the price. The new OnePlus 6 smartphone, starting at an attractive price of INR 34,999, comes with a large 6.28 inch screen sporting a body of the same size like that of its 2017 launch, OnePlus 5 (having a 5.5 inch screen), and larger still than the OnePlus 5T’s 6 inch screen. 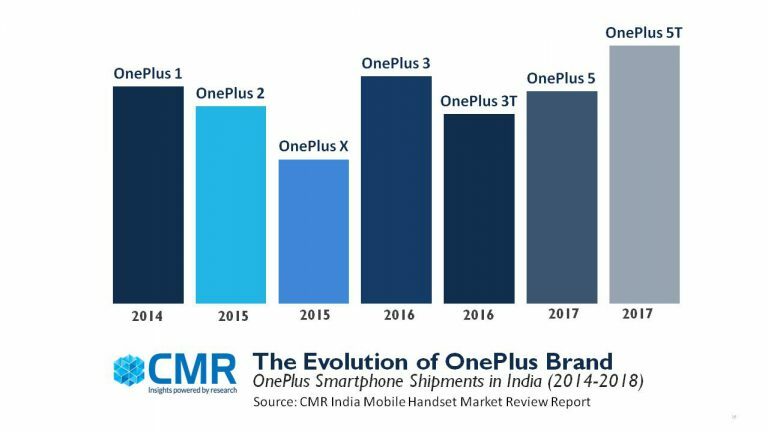 Since beginning its India operations in 2014, OnePlus has gone from strength to strength, clearly etching a premium Android brand positioning for itself. It out surpassed other contender brands, and has steadily gobbled-up the market share of the established smartphone brands. As the OnePlus brand evolved in India, it moved from its formula of having one flagship launch every year, to a strategy of having two launches in a year. The shift in strategy can be explained by the fact that OnePlus steadily gained acceptance amongst millennials with its superior specs, at unparalleled prices to beat. With a growing user base, OnePlus could attract its fans to go for an upgrade with a new launch every six months. The OnePlus 5T has been the highest shipped OnePlus yet. On the heels of the OnePlus 5T, the launch of OnePlus 6 is marked by a heightened sense of anticipation and excitement. OnePlus has been able to invest a lot of value in its device for its users, at much lower price levels than other premium brands. The new OnePlus 6 comes with the latest Qualcomm Snapdragon 845 processor ensuring speed and performance, and having 6-8GB of RAM and 64GB, 128GB or 265GB storage in its variants, alongwith the latest version of Android 8.1 Oreo. The OnePlus 6 brand is also keenly anticipated as it is one of the few smartphones to feature AndroidP Beta test. With the OnePlus 6, OnePlus has gone for a complete departure from its past. The smartphone features glass on the front and back, in placed of the curved aluminium that it featured in the 2017 edition with various finishes of curved glass. If one were to look at the camera, the front camera in the OnePlus has remained the same over the years, with only the rear cameras undergoing evolution. The rear dual cameras have upgraded over the past models, with OnePlus 6 coming with optical image stabilization. OnePlus 6 distinguishes itself from the competition by sporting a striking all-glass Gorilla Glass 5 design on the back. Unlike its peers in the premium smartphone category, the OnePlus 6 retains its headphone jack, and features partial water resistance, though it does not have an IP rating for the device yet. The OnePlus 6 sports a dual-camera system, with facial recognition to unlock the phone, and with its trademark quick charging, Dash Charger, arguably one of the best in smartphones, and a decently large 3,300mAh battery. A newly-introduced slo-mo video mode empowers OnePlus 6 to capture full-HD video at 240fps. The OnePlus 6 also sports a new Gaming Mode that can stop notifications from appearing while playing a game. When pitched against its competition like iPhone X and Samsung S9, the OnePlus 6 falls short on certain parameters. For one, while it claims “water resistance”, it is not IP certified to any degree. Secondly, it lacks Qi-wireless standard charging that its peers, S9 and X have. However, it scores big on display size, bigger than other flagships. When it comes to processing power, all Android flagships have the same processor, but OnePlus scores with some of its optimizations that impart speed and performance to the device. At CMR, our latest user research study, <a href=”http://www.cmrindia.com/shelf/mobilitywork-survey-of-technology-leaders-of-tomorrow/”>CMR Mobility@Work</a>, focusing on with entrepreneurs and those working in mid- and large- technology organizations reveals an ‘aspirational’ mindset. For those millennial entrepreneurs who work in open office environments in an “always on” workplace, they naturally place a premium on reliability, speed, and enduring performance. They hate slow and tardy devices, and are not shy of spending money on premium smartphone brands, such as OnePlus. The OnePlus 6, and the OnePlus 6T (rumored for late 2018) will potentially attract a wide range of smartphone users. For those millennials who have just entered the workforce and have thus far used only value-for-money smartphone brands, OnePlus 6 will be an attractive proposition to switch to, given that it offers, more or less, the same features and experience like that of an uber-premium iPhone X. There are smartphone users who are already using stock Android, and seeking an upgrade and/or, a far superior experience from their device. There will be other premium users seeking a replacement, and who would find the new OnePlus 6 pricing and specs better than what their smartphone brand offers. Given that iPhone X is uber-premium, OnePlus 6 could potentially attract some of the Apple loyalists to its side with its unbeatable pricing and specs. A word of caution, though! While it aims for the stars, and takes the competition to Apple and Samsung, it should also be wary of some new contenders, such as Nokia 8 Sirocco, Huawei P20 and Honor 10. In the Android Sea of Sameness, OnePlus 6 shines through on its strengths. While each OnePlus flagship has, over the years, upped the price from its predecessor, it still retains the price advantage compared to its competition, while delivering the best design build, quality and specs. Similarly, a lot of thought has gone into designing OnePlus 6 software, keeping it clean and fast. Also, full marks to the OnePlus 6 for eschewing the now famous quirks that its peers spot, whether it be the iPhone X’s Animoji, or Samsung’s AR Emoji. In essence, the OnePlus 6 packs a lot of the latest must-have specs, in a gorgeous design and at an unmatched price, holding its own, while competing against the very best, as well as the most expensive smartphones. Can the OnePlus 6 match or outstrip the OnePlus 5 and OnePlus 5T shipments put together? It remains to be seen.